Today sees a slight reorganisation of the Comics Forum website, and the launch of a new set of downloadable resources for scholars. The Affiliated Conferences page has now been moved into the new Scholarly Resources section (accessible from the top of all pages on the website). This section also includes our newly launched Digital Texts archive, which offers freely downloadable texts of relevance to comics scholars. The digital text archive is currently in its launch phase and as such contains a small number of texts, but we hope to be able to expand this collection as time goes on in order to provide a useful centralised hub for freely available, open access comics scholarship. We are particularly keen to feature previously unpublished material, or texts that have gone out of print, in order to help develop the breadth, longevity and sustainability of comics scholarship, and contribute to overcoming the sense of ‘reinventing the wheel’ that was alluded to in a post on this site by Randy Duncan and Matthew J. Smith in July of this year, and by Charles Hatfield in a post on the Thought Balloonists blog in September 2009. We are also interested in publishing new material where it is available, with the hope that featuring such material on this website can help it to find a wider audience. If you are an author and you would be interesting in making your articles, books, dissertations, essays, fanzines, theses etc. available via this archive please contact Ian Hague at I.Hague@chi.ac.uk. Already available in the Digital Texts archive we have Ian Gordon’s book Comic Strips and Consumer Culture 1890-1945, Dan Raeburn’s series of critical essays published as The Imp (four issues), and the UK Children and Young Person’s (Harmful Publications) Act, 1955, the genesis of which was discussed at length in Martin Barker’s A Haunt of Fears: The Strange History of the British Horror Comics Campaign. Click here to be taken directly to the digital texts archive. One of the oldest notions in modern journalism is that there should be a separation between News and Views. The news are in essence “the facts of the matter” while the views are the commentating, analyzing and pondering over the original facts. Although this generalization is overall synonymous for the coverage of all the traditional journalistic content (i.e. politics, foreign affairs, sports and even gardening), variables such as New-Journalism, imbedded journalism and the web 2.0 user generated content, makes this distinction a little blur. To make things even more complicated, there is no such thing as a definitive guide to journalism’s “Best Practice Approach” and journalists often mix different coverage traditions and trends in their work. It is therefore no surprise that there is no consensus on the “Best Practice Approaches” to war correspondence coverage in particular. True to that notion, this presentation argues that the same separation of News and Views exists in documentary comics dealing with real-world current events as well. Furthermore, this presenter wishes to draw lines between different journalistic coverage approaches and the art-form best suited to it. Strips or short form stories complement news coverage and traditional correspondence while long form stories and Graphic novels complement in depth analysis of data, and complex conflicts. Graphic Novels would also fit well with new-Journalism. A series of questions arises following this argument: is there a combined “best practice” of creating illustrated war correspondence leaning on both the journalistic aspects and the artistic ones? What elements – artistic, literary and journalistic, should it include and what are its limitations? The last point to be dealt at this presentation would be presenting the findings of a research which compared audience acceptance of messages in one short-form comics project (the strips in “To Afghanistan and Back” by Ted Rall) and one long form graphic novel (“Combat Zone” by Karl Zinsmeister and Dan Jurgens (A)). The findings of this research answers some of the questions mentioned earlier. Combining both qualitative analyses of the different forms of documentary comics with a quantitative survey of the readers’ responses to the content also helps to understand the potential effect of the publication with the audience. 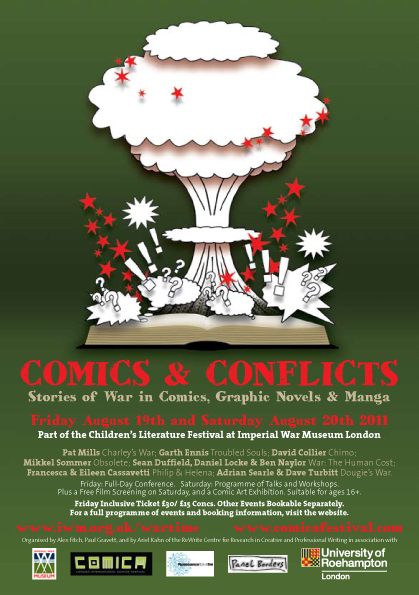 Click here to be taken to the Comics & Conflicts (2011) archive, where you can download the full paper and PowerPoint presentation.